How I Feel About Books: Lucky Four Leaf Clovers! Today a class from SRVS came to the library wearing green (I checked, pinching fingers poised!) to hear some St. Patrick's Day stories and make a craft. I hate to say it, but I had a tough time finding decent books for this program. 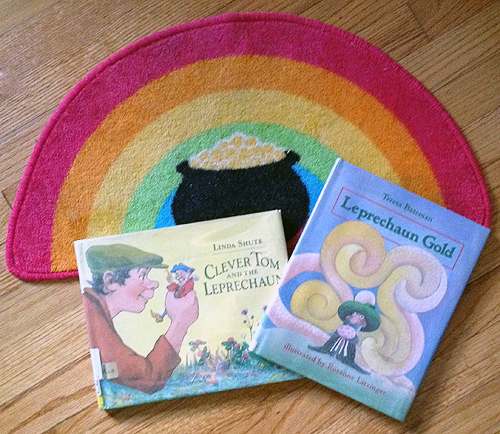 I thought there would be a lot of fun books about St. Patrick's Day, leprechauns, rainbows, and luck, but I didn't find much. I checked out about a dozen library books, but none of them stuck out to me as being fantastic to share. The two I ended up picking were, in my opinion, the best of the selection I had access to, but the audience didn't seem to care about the stories too much. Luckily (see what I did there? ), we had a fun craft planned! We made four leaf clovers by folding strips of green paper! This project would typically call for glue sticks, but the paper I had was more of a yardstick, so we had to use clear tape to make sure everything held together without popping loose. 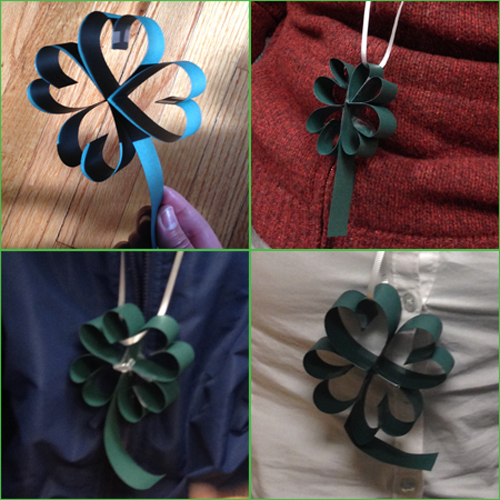 After we folded and taped, we strung the clover onto necklaces so we could wear luck all day long. Some people even made extra clovers to take back to the learning center and spread the luck around!